"Stuffed peppers in a soup bowl. Tastes just like stuffed peppers! Garnish with parsley." Saute onion, celery, garlic, and green pepper in oil until just tender. Do not brown. Stir beef into vegetables; cook until beef is browned, about 10 minutes. Stir in rice. Add tomatoes, juice, water, parsley, sugar, salt, and pepper to the browned beef mixture. Cover, and simmer 45 minutes or until rice is cooked. Adjust liquid if necessary. Stir in cinnamon. Taste for seasoning. Garnish each serving with a parsley sprig. If you are a salt-o-phobe as I am, ignore your instincts. Add the salt. A bland soup without it. This was great soup. We love stuffed peppers and this was the easy way to get the same taste! easy to make, wonderful soup. I loved it because fof that and it was good and thick. I added just a dash of cinnamon but did not like this taste and left it out the second time I made it. Excellent supper soup. I increased the celery to 1 cup and added a generous dash of allspice instead of the cinnamon. Very good. Tastes even better the second day. The cinnamon is a nice twist. I added 3/4 lb. hamburger, could use up to about 1 lb. Will definitely make again. 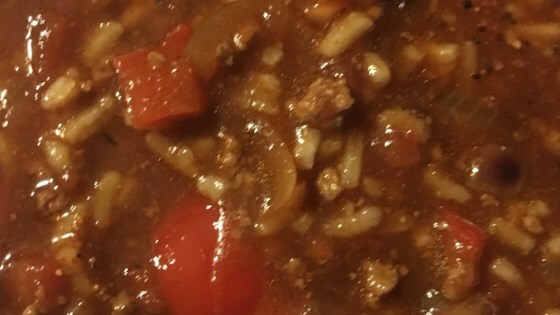 My kids do not like stuffed peppers as a meal but they love this soup....go figure. What's amazing is it tastes just like the meal! !